How this major oilfield service firm automates the interactions with its suppliers. I gave a talk not long ago on supply chain collaboration at CONVERGE 2011, TAKE Solutions’ annual customer conference in picturesque Hamburg, NJ. The session right after mine, by Tony Aming, Enterprise Business and Applications Architect at Baker Hughes, was a great example of collaborative integration in action. Tony described how Baker Hughes automated their procure-to-pay process and integrated suppliers into the process. I was impressed and decided it was worth writing about what they are doing. Baker Hughes is a $14B (2010 revenue) provider of oilfield and gas field services including Drilling, Evaluation and Fluids; Completions, Production and Chemicals; Pressure Pumping; and Reservoir Development Services. They have over 50,000 employees operating in over 90 countries. Baker Hughes invests a greater than average percentage of revenue in R&D on both short-term applied engineering and long-term basic research to develop new technology. Within this context, Baker Hughes wanted to optimize its Procure-to-Pay (P2P) process to improve the accuracy of invoices and other purchasing documents, reduce the manual labor involved in processing transactions, reduce errors and the work of resolving them, minimize delivery delays, and reduce late payments and the resulting penalties. They launched a project using the OneSCM Supply Chain Collaboration platform from TAKE Solutions to automate the full P2P process from P.O. to settlement across all types of spend—direct materials, indirect, MRO, equipment, and services. They also have automated the RFQ process, but it has not been as widely adopted yet. Figure 1 below shows the footprint of their implementation. The platform is integrated on the backend with Baker Hughes’ SAP system.1 PO documents originate from SAP, as do Change POs, Goods Receipt, and Quality Inspection. The OneSCM platform sends documents back into SAP including PO Acknowledgement, ASN (Advanced Ship Notice), QUD (Quality Usage Decision), and Invoices. SAP creates the Invoice Response and Remittance Advice documents which are sent back to the platform and ultimately to the supplier. Baker Hughes is organized into nine regions worldwide, each with their own IT organization. The central procurement group worked with the business in each region to determine which suppliers to roll out first based on A) volume and value they supplied and B) problems that needed to be solved with the supplier such as delivery or payment issues. Each region also has its own set of challenges that influence how quickly they can adopt. For example, in Germany a digital signature is required. The rollout process for suppliers is pretty streamlined, especially if they are just accessing the portal—smaller suppliers or those with less sophisticated IT capabilities only need a web browser, by which they log in to the Baker Hughes procurement portal to enter all transactions. For on-boarding portal-connected suppliers, Baker Hughes first explains the system and process to them, then conducts a two-hour remote (WebEx) training session (usually the day before going live), and then (on the go-live day) moves over all the open POs and other open items. The suppliers are immediately able to transact and have full visibility on the system. B2B integration (system-to-system/EDI) takes a bit longer. Baker Hughes implements a full set of XML-driven B2B transactions with suppliers, including PO, PO Response, PO Change, ASN, Invoice, and Invoice Response. Some suppliers cannot support the full set, such as PO change, which can complicate the implementation. For B2B integration, the whole process has to be really well understood, hence it is more challenging and time consuming than bringing a supplier up on the web portal. With the new system, documents are automatically generated and sent, rather than the old way of using email or fax. That has taken a lot of manual work out of the system. Now suppliers have a single place to look for POs and manage the relationship, rather than having to comb through emails and make dozens of phone calls to different people. Once they ship the goods, suppliers send an ASN which is automatically linked to the original PO. In this way Baker’s receiving personnel know exactly what was ordered and what was sent, and can plan ahead. In the past, missing documents caused many delays, which are now avoided. Suppliers are able to "flip" PO lines to create invoices and Baker Hughes does 3-way and 4-way matching with all invoices. The system compares the purchase order, goods receipt, quality inspection (for 4-way match), and then automatically creates the invoice on behalf of the supplier in the back-end SAP system. Typically this all happens within two hours of the completion of receiving and/or inspecting the goods. Baker Hughes has been able to realize payment term benefits because of this. This approach has resulted in enormous improvements in invoice first pass yield—the rate of accuracy in creating invoices and posting payments in SAP that match both the purchase order and the goods receipt, on the first try without having to redo anything. Baker Hughes used to commonly have below 50% first pass yields. Now it is almost always above 99%, and for many months it is 100%. The platform also does business activity monitoring (invoices and payments) for Baker Hughes. When an invoice from a supplier is received and matched, the OneSCM platform sends the information into SAP to create the invoice. If for some reason the invoice doesn’t get created, the appropriate people at Baker Hughes are automatically notified that an IDoc is failing in SAP. The same thing happens with the other operations and documents. Thus problems are noticed and resolved quickly. 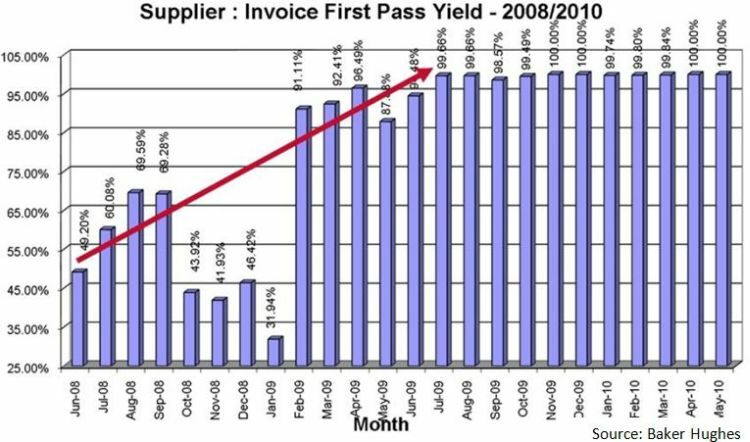 Baker Hughes also has a dashboard to monitor overall transactions called the “Supplier Invoice to Payment Console” (see Figure 3 below) which shows the volumes, errors, and other information. In Part Two of this article, we look at the process of ramping up to volume for Baker Hughes, as well as benefits such as how this type of automation provides additional flexibility to them. 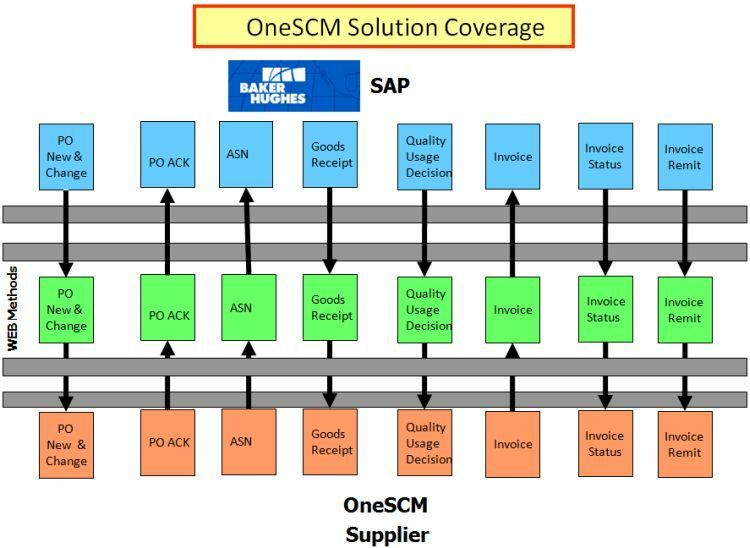 1 Note: In addition to SAP integration capabilities such as those implemented by Baker Hughes, TAKE’s OneSCM has especially strong integration with Oracle E-Business Suite—in particular Oracle Process Manufacturing and Oracle Discrete Manufacturing. TAKE has integrated with over 450 Oracle implementations. Return to article text above.